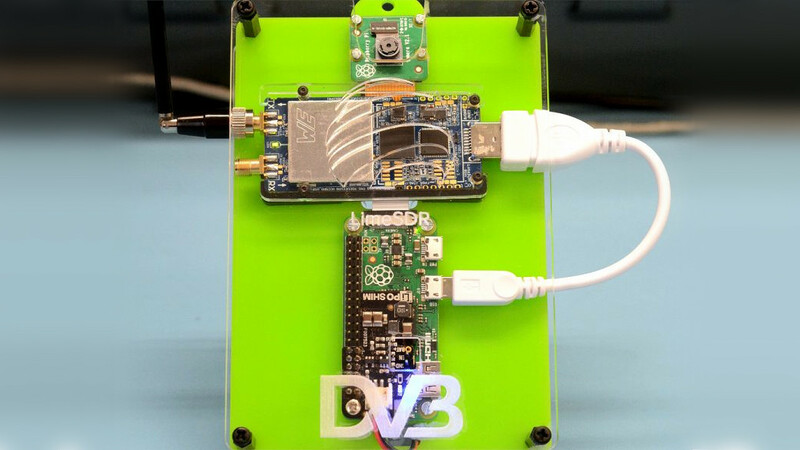 Evariste Coujard's experimentation with a UNIX-like "KISS" DVB transmission pipeline formed the basis for a self-contained, battery-powered Raspberry Pi and LimeSDR Mini based DVB transmission system. Evariste’s own experiments led to early successes, after focusing on combining his professional history developing for the Digital Video Broadcasting (DVB) standard with a freshly-acquired LimeSDR and Raspberry Pi. “My first [project was a] DVB transmitter using the Raspberry Pi’s general-purpose input-output (GPIO) header, received by a commercial set-top box. When I heard about PiFM, which could transmit HF [High Frequency], I was very proud to learn how it works. 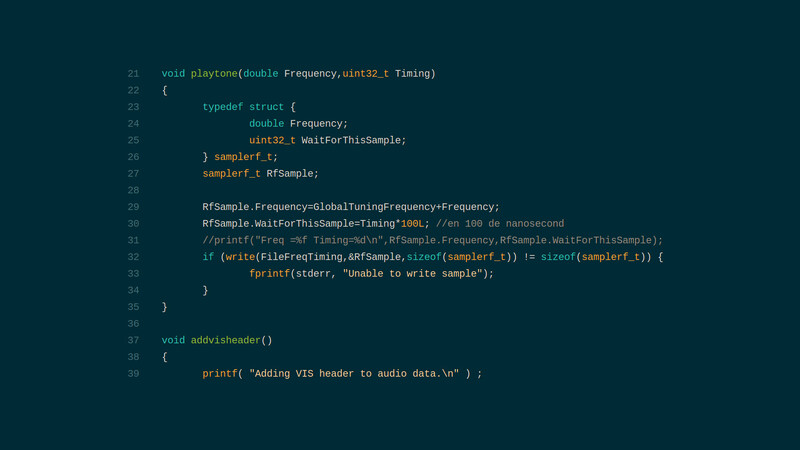 After hours of storming I wrote rpidatv, an ugly DVB modulator using GPIO [General-Purpose Input/Output header] – Nyquist is my friend – and few months after wrote a minimal IQ SDR transmitter called rpitx. Evariste’s initial project spawned considerable discussion and further experimentation, and was followed by a less ‘hacky’ variant using a LimeSDR Mini software defined radio. Evariste’s successes, shared via the Myriad-RF forum and micro-blogging service Twitter, raised the possibility of using the low-power and compact LimeSDR Mini and Raspberry Pi Zero single-board computer together with an internal power source to create the world’s smallest standalone DVB transmission system – a task which Lime Micro’s Andrew Back took on. “We added a Pimoroni LiPo shim and tiny LiPo battery pack to the Pi Zero transmitter, to make it fully untethered,” Andrew explains. “In fact we built all of this onto a piece of acrylic that can be worn on a lanyard, like a name badge – so, OK, tethered! The receiver uses a second LimeSDR Mini with a Raspberry Pi 3 Model B, to which we added a Pimoroni Hyperpixel display in order to give a neat, integrated solution. “The transmitter and receiver were put together as demonstrators and the reaction at industry events — where we’ve shown a tiny body-worn self-contained DVB-S transmitter with integrated battery and camera — has been one of sheer amazement. The receiver also runs a spectrum analyser display which gives you a frequency domain plot, amongst others. When the transmitter is started you can see a signal appear in the plots, and once the DVB-S receiver stack is able to decode video this is then displayed in its place. The software stack put together by Evariste for the project is built around a core UNIX-like philosophy of chaining together multiple tools each of which do one job well. “The stack is quite interesting in that it’s much more embedded than you typically see with open source implementations of various standards/systems,” Andrew explains. Naturally, the project builds on existing software: LimeSuite handles interaction with the LimeSDR, while Fourier transforms are handled using the Fastest Fourier Transform in the West (FFTW). 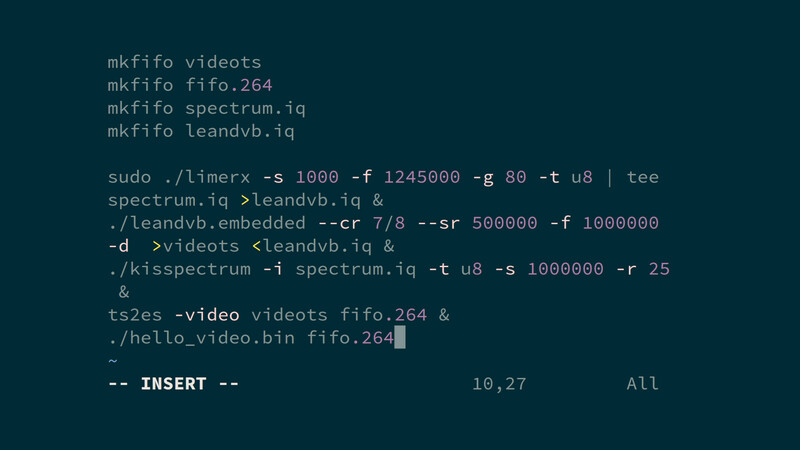 Conversion, modulation and transmission of the video from the Raspberry Pi Camera Module is handled using Evariste’s avc2ts utility, a modified version of Charles ‘G4GUO’ Brain’s libdvbmod, and limetx from Evariste’s limetool software, while reception and display is handled by the leandvb lightweight DVB-S demodulator and a similar collection of other compact utilities. The source code and instructions for Evariste’s project can be found on his GitHub repository under permissive licences, while Andrew has shared the Lime Micro DVB demo pipeline on the Myriard-RF forum. An alternative approach to digital video transmission using the LimeSDR family, written by Alexandru Csete based on GNU Radio and Ron Economos’ gr-dvb family of tools, can be found on the Myriad-RF blog. Double the capacity (4x4 MIMO) of the original LimeSDR PCIe, this board is at the heart of the LimeNET Core and, by extension, the LimeNET Base Station. LimeSDR is a low cost, open source, apps-enabled (more on that later) software defined radio (SDR) platform that can be used to support just about any type of wireless communication standard. Lime’s second-generation field programmable RF (FPRF) transceiver IC covers all the way from 100kHz to 3.8GHz, with 2x2MIMO and extended functionality. Lime launched Myriad-RF in 2012 as an open source program to make available a range of low cost RF boards, together with their design files, supporting software, associated documentation and collaboration tools. "The open software/hardware helps me to understand and utilise all the features that [the LimeSDR Mini] has," explains Kis. "The development time for the limeSNA was about 8-16 hours thanks to the examples and the open source libraries." "I would encourage anyone to give this a try," says Daniel Estévez. "If you already have a LimeSDR or a similar SDR supporting large bandwidths, you already have the most expensive piece of equipment. The rest is standard equipment for satellite TV and it is really inexpensive." "The most important aspect for amateur use of SDRs is that the driver software and toolchain, and the device’s capabilities, are open-source and well-documented," explains BATC chair Dave Crump. "The LimeSDR wins in that it is generally open source, with all the documentation online." The creation of Andreas Eversberg, Osmocom-Analog - built out of a sense of nostalgia, he explains - allows vintage analogue cellular hardware to live again, connecting to a LimeSDR or LimeSDR Mini equipped PC-based base station. "I find the ability to modify and look at the source code to be really valuable," explains Carl Michal of his experiments with the LimeSDR in NMR spectroscopy. "I've learned a lot from tinkering with the LimeSDR that I'm sure I wouldn't have with a proprietary system." "I plan to implement the spectrogram accelerator on a LimeNET Micro and distribute it via LimeNET Store," says developer Gaspar Karm of his effort to implement a hardware-accelerated spectrogram on the LimeSDR family's field-programmable gate array (FPGA) chip. What do you get if you combine the Raspberry Pi with the LimeSDR Mini? If you're Sam Machin, Andrew Back, and colleagues, you get 16 rapidly-deployable GSM base stations for use at Electromagnetic Field 2018, a three-day event held in the middle of a field every two years. A project which has seen an LMS7002M-based LimeSDR software defined radio installed on the International Space Station to map and monitor global radio frequency spectrum usage, MarconISSta is already showing interesting results from its early data. "The final goal is to have a generic satellite receiver that is easy to configure to a new satellite or protocol," project originator Lucas Teske explains of the Open Satellite Project and its open-source weather satellite software. A LimeSDR-compatible feature-packed open source cross-platform SDR application for ham radio and general purpose SDR workloads. "What all these updates have in common is that they’re proving that our network transformation is real. It works," says Andre Fuetsch. "We know there are entrenched interests that want to see the old models prevail. But that's not happening. We're determined to find a better path forward for ourselves, our industry, and, most importantly, for our customers." ITU filings reveal a 3,236 satellite constellation in low Earth orbits, providing coverage for around 95 percent of the world's population - and a clear reason behind last year's launch of the Amazon Web Services Ground Station platform. "We are excited to collaborate with O-RAN Alliance in bringing communities together to create software for this important access area of telecommunications," says the Linux Foundation's Arpit Joshipura. "This step towards execution marks another major milestone in networking partnerships across standards and open source organisations." "A statement will be published in Q3, with auction applications expected to begin in December 2019," the UK's communication regulator explains. "We will also publish a statement in Q2 on potential spectrum-based solutions to improving coverage both indoors and in rural communities." "5G is indeed the next big thing in wireless," says Pai. "It has transformative potential, including much faster speeds, much lower latency, much more capacity, and new services and applications, many of which nobody can even predict today." "Drones offer exciting opportunities for the future that will benefit society and the economy. However, we need to make sure they are used safely and responsibly," explains Vodafone Business UK director Anne Sheehan. "We are delighted to bring our mobile connectivity expertise to the NBEC consortium so that drone technology can be further tested and developed." Report points to "the incorporation of more detailed, real-world GIS data; real-time spectrum sensing data; the growing sophistication of propagation and interference modelling; value-added, cloud-based database services; and the potential to combine blockchain technology with dynamic database coordination." "The basic idea: find scheduling solutions through solving a certain number of small and independent sub-problems on the GPU in parallel," the team explains. "The solution to each sub-problem is a feasible solution to the original PF scheduling problem. The output solution of GPF is then the best one among all sub-problem solutions." "For the first time, TIP is showing how its technologies fit together across a telecom network," explains executive director Attilio Zani. "Together, this suite of solutions utilises a software-centric, vendor-neutral approach that highlights the value of disaggregation and the power of interoperability for more agile, cost-efficient networks." "Magma enables new kinds of network archetypes where there is a need for fast, incremental upgrade cycles and continuous integration of software components," the company claims, "all while allowing authentication to and integration with a classic LTE EPC."